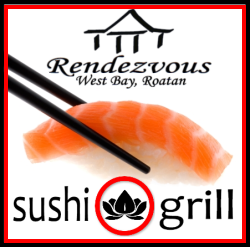 Sushi in Roatan gets no better than Rendezvous Cafe des Arts and Sushi Grill in West Bay Beach, Roatan. Top rated Roatan restaurant on TripAdvisor! Excellent sushi! What a surprise to find sushi on Roatan even better than back in the States! The owners/chefs, Lila and Eric, are wonderful hosts, too. outstanding food, relaxing atmosphere, friendly welcoming hosts. Even with no power we had a fabulous meal! Loved it and going back to Roatan - will have the sushi again - hopefully with power this time! Rate Rendezvous Cafe des Arts & Sushi Grill!